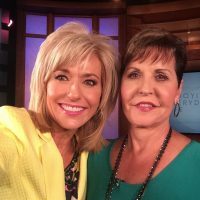 Beth Moore took a selfie with Joyce Meyer while appearing on her show. (Geri Ungurean) I remember when I first watched Joyce Meyer after some women at church recommended her. It’s hard to put into words, but I felt that something was wrong. I had no desire to watch or listen to her again.